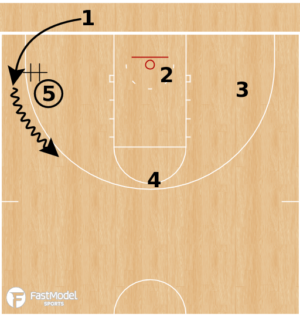 This baseline inbound play was contributed by Justin Cellars, Men’s Assistant Basketball Coach at Lamar Community College, to the FastModel Sports Basketball Plays and Drills Library. The play was run by the Michigan Men’s Team. My intent with the posts that I make is not to say that the play should be run as it. The hope is that you will get some ideas of ways that you can add or change what you currently do that will fit your personnel, your philosophy, and your system. 2 walks his defender in and cuts around 4 and 5 to the middle of the lane. As 2 gets around 5, 5 will pop out for the entry short corner. 1 receives a hand-off from 5 and dribbles out. 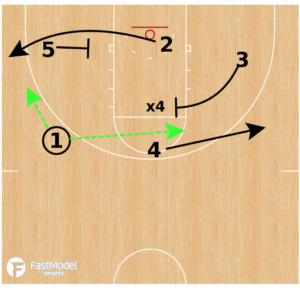 As 1 begins to dribble up after receiving the hand-off, 3 is sprinting into a flare screen for the 4. 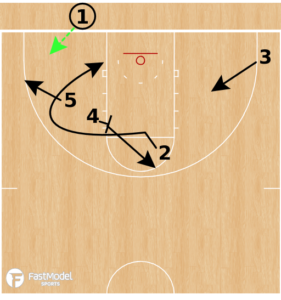 5 is setting a down screen for 2 sprinting out corner.